What I like most about the Fader Port is that it has made my mixing so much more organic and easy by getting me away from the mouse and giving me all the control I need over every channel strip in my DAW. The big selling point on this guy is the motorized fader. I own a few different Midi keyboards that have assignable faders on them. While it is convenient to have a bunch of faders on my keyboard, none of them are motorized, which means that in order to get the DAW to respond to the fader, I need to move the fader on the keyboard to the position of the fader in the DAW. This can be very very very tedious and more often than not, cause you to lose the position the fader in the DAW was in, which means you to figure that out again. ANNOYING. Well, that problem is solved with this unit. The only thing I have found to be annoying on this product is for some reason, I can't access the last three channel strips in my DAW. It matters not if I have 10 channel strips or 20, its always the last three. Its probably something I am missing as I haven't referenced a manual yet (bought it used and it didn't come with one). I got this for only $60 which is about half price so I am very pleased about that. Times are tight so I probably wouldn't have paid full price for it, not that its not worth it, I just couldn't afford that much right now. If I had the money, I wouldn't bat an eye when buying this new. Presonus makes some pretty nice gear despite the fact that it is usually affordable. This is no exception, the fader is long throw style and very smooth. The buttons all respond very well but they can be a little "clicky," as opposed to a nice soft rubber button, these click very loud and are plastic. This unit has no effect on sound quality so that question is irrelevant. Besides M-audio keyboard controllers, this is my first midi mixing controller. Yes, I would definitely buy this again. I hope they release the same exact product but with 12 or more faders, that would be awesome. The PreSonus Fader Port is a motorized MIDI based mini control surface, designed for use with your digital audio workstation. It is nice and small and is perfect for controlling your basic functions without having to control everything inside the box. This controller has a single fader, transport buttons like rewind, fast forward, stop, play, and record, as well as options for automation, channel selection, mute, solo, record ready, and pan. It also has buttons for window viewing options and other transport functions. This model is very easy to use and is quite helpful if you are looking to go outside the box and use some actual buttons. It is perfect for those on a budget who don't want to get a full fledged control surface either for price reasons or size. 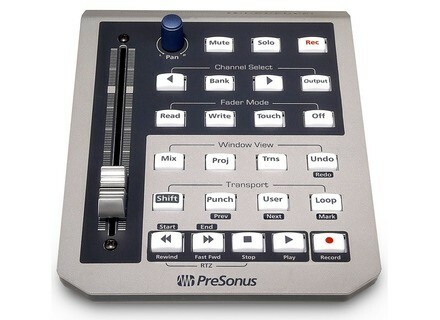 The PreSonus Fader Port is easy to move around and is also great for the portable studio. The price of the PreSonus Fader Port is probably the best part, as it is aimed at home studio owners more than the professional studio owner. PreSonus makes some good products at a cheap prices, and this is another great innovation from the company. While this isn't the most sturdily built piece of equipment, if you treat it right it should last a while. 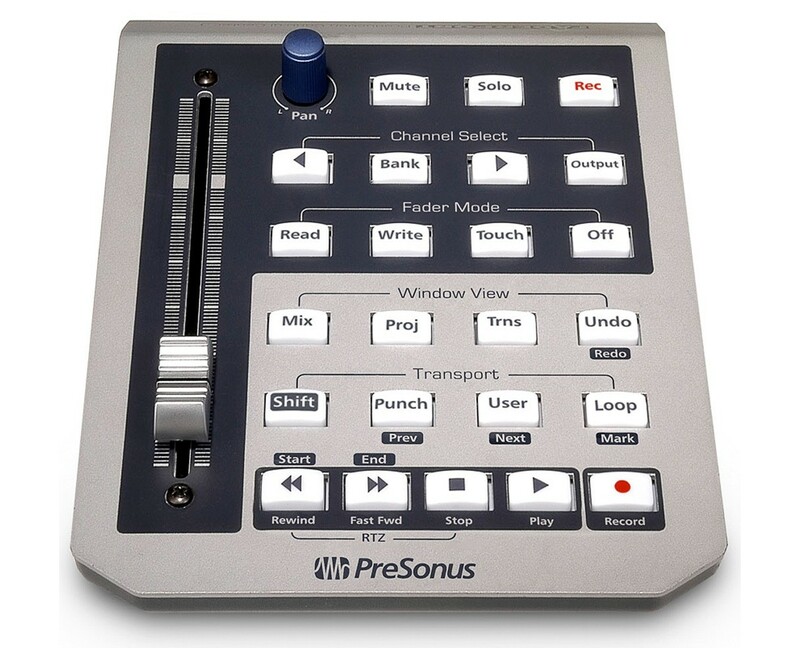 The look of the PreSonus Fader Port is pretty nice, with all types of colors and flashing lights that will be sure to impress the clients. Everything is laid out smartly and is easy to find, making it easy to use overall. While I don't always use all of the functions possible on this unit, I find that it is worth it to use for the basic transport and fader options alone. All in all, the PreSonus Fader Port is a nice little control surface perfect for home and small recording studio owners. PhiBee's review (This content has been automatically translated from French)" Content for my use"
Use for over 2 years. Protools 9 at baseline and 10 currently on Macbook Pro 2012 and OS 10.9. I need to pre-mix or act on writing automation with other mice, especially being a musician and sound designer (shorts, institutional, museum, audio book) with me in my modest home studio. I love its simplicity, its motorized fader, stability and transport functions or some other. I would have liked to have a direct access to the first plug in insert key example, with a possible increment in the inserts of the selected slice. Especially since in protools, a button is unused. But I quibble! jeanpaulpollue's review (This content has been automatically translated from French)" very good stuff, but design could be improved under Live"
I use it for 3 days with Ableton Live 8, and as you say I am completely satisfied. For the same budget, I actually hesitated between AlphaTrack the BCF2000 and obviously FADERPORT. But I found the Alphatrack may be a bit too cheap for my taste, as well as the BCF2000. What I especially pushed this choice is the quality of the fader, it is extremely accurate with his fader 10cm long, its build quality and its silence. And personal choices, the lack of space at home for a Mackie Control, and the fact that I often travel with my equipment for services outside of my home studio. It is necessary to connect an external power supply to use the motorized fader, which is self-powered by USB, but that's the price to pay for a fader responsive, accurate and smooth. It is said that on a lot of forums that it is not compatible with VST plugins, but there is in Live mode "plugin control." That being said, it is sufficient to position on runway plugin to control; press the button Touch the FADERPORT to put in "control plugin" to navigate through the various plugins (there is no indicator to tell you what level you are, so be it head) with the left or right and then select the one you want to control with the Bank button. Then you navigate through the various controls of the plugin in question with the left or right. Once we understand how it works, we can finally use the fader (with a resolution of 1024 points I think) to control all the envelopes that you want! The price / quality ratio is very decent for what is proposed. I remake that choice without hesitation if it falls behind. yanki's review (This content has been automatically translated from French)" A purchase of emergency for the mobile studio owners!" I use it for one week. I tried a lot of model before it, like the Behringer BCF 2000, a Euphonix MC Mix and even insipidity of big Euphonix console. I think if like me, you look mobility (macbook pro) and one just bland (for follow-up of voices, and easier access to the features of Logic or Pro tools: although there are also shortcuts for that); FaderPort this will satisfy you 100%. Compared with a BCF2000, no photo ... I much prefer to have the same price a good flatness held silent long years rather than 8 faders cheap noisy! I think the factor more robust than the Euphonix MC Mix (very fragile). I hsit with the Behringer BCF 2000. But I did not need a lot of faders. The installation seemed so simple on the PC BCF. Fed to the computer! And indeed, zero-bp, the first installation of the driver and then update the firmware supplied with the file presonus site. Use in cubase 4 with perfect intgration the flow of soft. Relatively quiet engine of the fader. J'hsite buy 2 notches so the buttons are convenient and intuitive shortcuts. Table mix, transport etc ... accessible by a button!